You’re so careful with your beautiful new rug, but then you host a party and someone accidentally spills something. No need to panic. 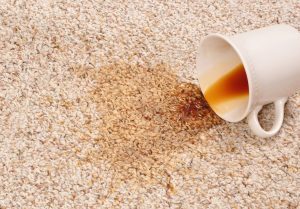 Here are some suggestions to tackle carpet stains with easy home remedies. Most basic stains can be cleaned with simple a home formulas: blot the area with club soda, and if needed, a small amount of soapy water, then rinse and pat dry. Mix 1/4 cup of white vinegar mixed with 32 ounces of water. Then blot with soapy water, rinse and pat dry. Layer paper towels on the stain. With an iron on the lowest setting, press down on the paper towels to absorb the oiled grease. Then clean with a solution of white vinegar, soap and warm water. Moisten the carpet, blot with dish soap and water, then pat dry. *For stubborn stains: apply a few drops of dry cleaning solvent or make-up remover. Wrap ice in a cloth and place it over the wax or gum until it hardens. Scrape off stubborn spots before they soften. If these home remedies don’t work to your satisfaction, call a professional like Nap’s Maintenance Service to tackle these complicated stains. 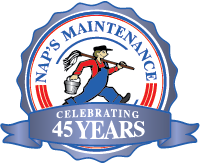 With over 45 years of experience, Nap’s Maintenance Service, Inc., has established a reputation for solid service in the Attleboro area. Nap’s offers a wide range of commercial, industrial and residential maintenance services, establishing a solid person-to-person relationship with each of our customers. If any of these stain removal processes don’t work for you, call Nap’s Maintenance Service to learn more about our in-depth, heavy-duty carpet cleaning treatments.